Can you find the subjects of these sentences? The students from the classrooms at the end of the hall were very noisy. Each of the students in my class studies diligently. 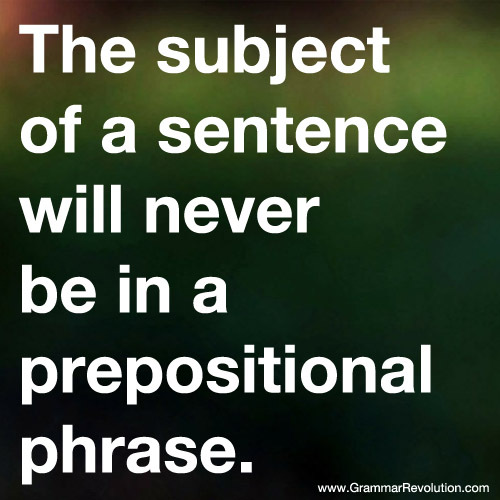 Tip #1: The subject of a sentence will never be in a prepositional phrase. Of course, that tip is only helpful if you know what prepositional phrases are! 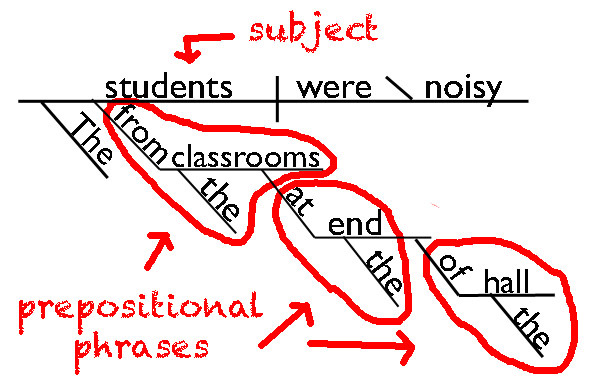 Prepositional phrases are groups of words that start with a preposition and end with a noun or pronoun. Check out the prepositional phrases page to learn more. 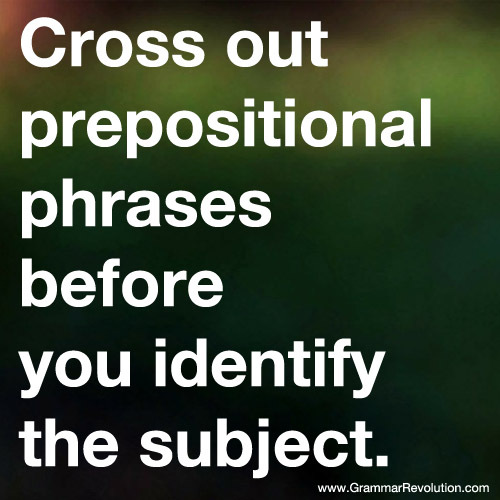 Tip #2: Cross out prepositional phrases before you look for a sentence's subject. You might look at that sentence and have brain-overload. You know that subjects are usually nouns, but there are four nouns in that sentence. Eek! What are you going to do? 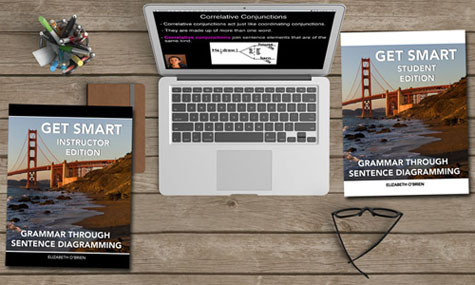 Since prepositional phrases contain nouns and pronouns, when we cross them out, we eliminate many potential subjects because we're eliminating many nouns or pronouns. Now it's much easier to see that students is the subject of the sentence. Can you identify the subject? This sentence has three contenders. You might be fooled into thinking that students is the subject of this sentence. After all, the sentence is about the students, right? Well, sort of. The subject of the sentence is actually each. 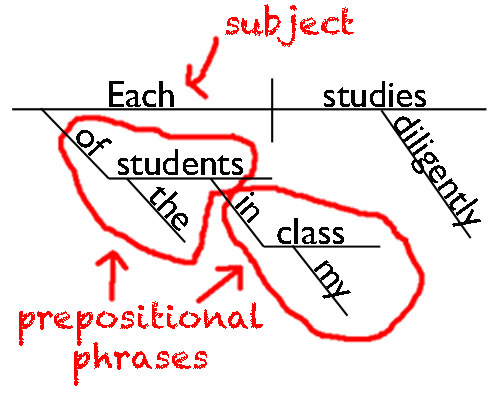 If you know your prepositions, you know that of the students is a prepositional phrase, and subjects will never be in prepositional phrases. Now it's much easier to see that each is the subject of the sentence. I am so very impressed with your course and style of teaching. My boys are engaged and learning. Garrett pulled his latest grammar test up by 13 points! Your website is amazing. I am currently doing my student teaching in NYC and your website has been a HUGE help to me. Thank you so much for your vision and for making it happen to help others.